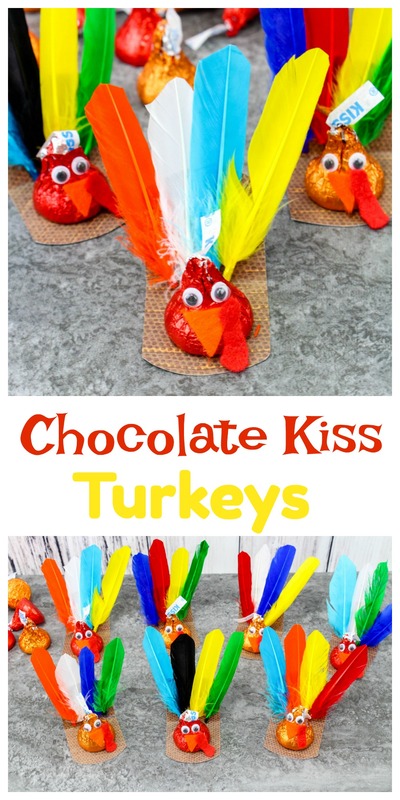 Chocolate Kiss Turkeys are a Fun Thanksgiving Treat! Thanksgiving is going to be weird for us this year. It’s the first one without my mom and my dad said that he’s not doing holidays at his house anymore. I get it, but since most holidays have been held at their house since, well forever, it’s going to be weird to have them elsewhere. My sister is taking Christmas at her house this year, so I took Thanksgiving. I know that since it’s going to be the first major holiday without mom, it’s going to be extra hard for all of us. That’s why I decided I wanted to try to make Thanksgiving as fun as possible this year. One way that I am making it fun is by putting out some Chocolate Kiss Turkeys at each place setting. They are pretty easy to make and they are wicked cute! 1. Cut 8 rectangles from the brown paper, approx. 2 ½ inches by 1 inch. 2. Cut 8 tiny triangle beaks from the orange felt, and 8 little wattles from the red felt. Just make sure you make them small enough to fit on the kisses. 3. On each Hershey kiss, glue on 2 googly eyes, a beak, and a wattle. 4. Fold each brown rectangle in half, crease it well, then open it back up. 5. On the back half of the rectangle, dab glue all over it. Press 4 little feathers in a row on the glue. Fold the paper back in half and press on it for about 10 seconds. Open it up so the feathers are facing up in the air, and the bottom half the brown paper is flat against the table. 6. Glue the Hershey kiss turkey to the bottom half. The feathers should be standing up behind the kiss. 7. 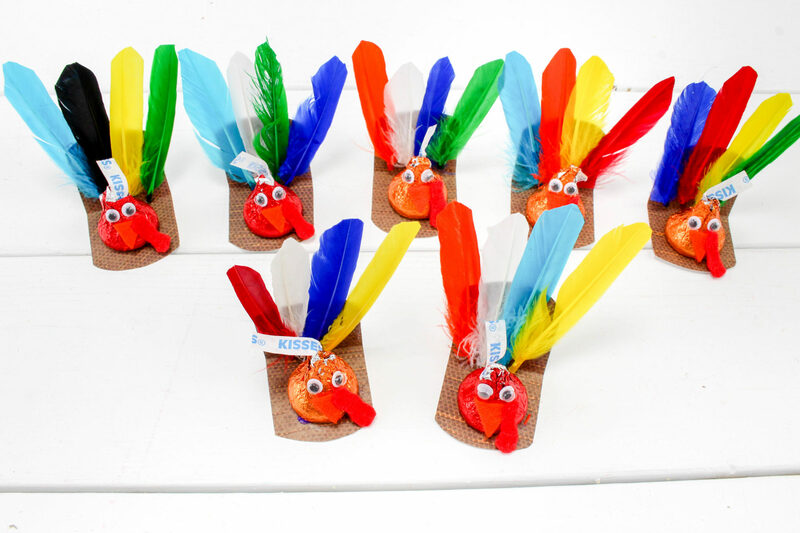 Enjoy making these cute little Thanksgiving turkey favors! I am really excited to put these out for my family on Thanksgiving. I think they will really get a kick out of them. 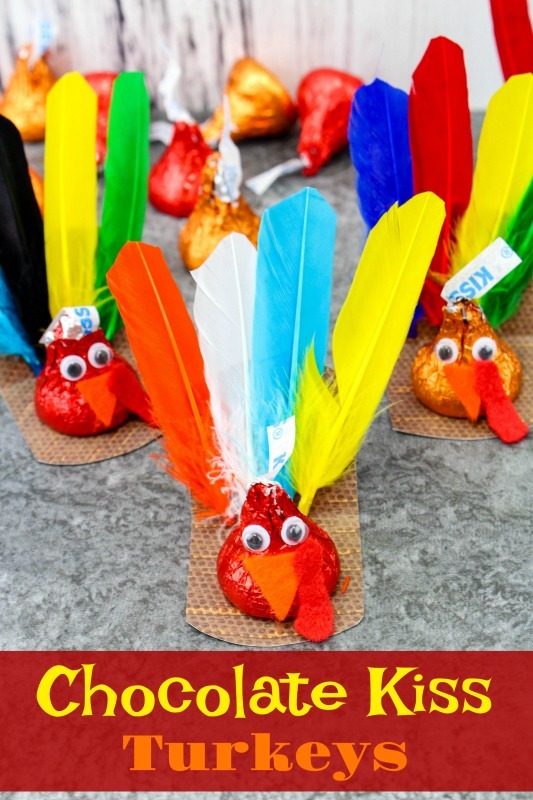 Will you be making these fun Chocolate Kiss Turkeys this Thanksgiving or do you have another fun treat idea that you’re planning on making? Robin, those are completely adorable! I’m totally pinning them now. I love how colorful and most of all EASY they are to make. Those are super cute! I love the idea of making little decorations for Thanksgiving like this. They’re adorable, and they’re CHOCOLATE! Those are awesome! They make great decorations, and of course, when you’re finished with them you can eat them. Om nom nom. Oh wow. Such a cute idea! This would look nice in the dessert tray and as decoration around the house. I would just wonder how long I can keep this on display with kids in the house. Haha. Thanks for sharing! I don’t think these would last long as decoration with kids around. Not my kids anyway haha! These Turkey Kisses are seriously cute! My grandchildren would love this! Thank you for sharing this delicious craft! I will get the materials ready and start making them. What an adorable idea! I love little crafts like these that are super easy and fun to do. My daughter would enjoy doing something like this with me for their little party they have at school! This would be adorable on the kids’ table at Thanksgiving! I’ll have to get the stuff and let the kids make these. Too cute! My daughter and I have been looking for age appropriate crafts to make with her young children. These are perfect. So much fun to make, kids going to love making these turkeys. These are the cutest! I’ll have to show my daughter when she gets home from school. I’m sure she’ll want to make some. This is such a fun treat for Thanksgiving. I love the way this uses a chocolate kiss and only one – so it’s portion control, too, for the kids. We will be trying this one for sure. This is such a cute idea and such a creative treat for thanksgiving! Thanks for sharing! I love crafts! In general they’re just fun to do, but I love with their themed like this because when your kiddo makes it and you set at the table it gives them such a sense of accomplishment. These are so adorable! They would look cute on our table for Thanksgiving. I am always amazed at your creativity. These turkeys are really a great craft and everybody loves kisses. I don’t know if I can keep the kisses that long in this house. So cute. Those would really liven up a kids Thanksgiving table. The only problem is everyone would eat the cuteness. I haven’t even seen the Thanksgiving colored kisses but now I’ll be on the lookout. Such a cute idea! I don’t know how you do it Robin. You always have such cute and original ideas. This one is nothing but amazing! I love how simple these are to make, and require little craft experience. These would be perfect for a class party. What an awesome idea!!! I think those kiss turkeys are going to be a hit during your Thanksgiving dinner. They are adorable. These are so cute that I want them all over the house. I usually supply a craft for the littles at our house but this year there won’t be any! I’m going to share with my neighbors. They will love this. Now this was a great use of chocolate kisses for Thanksgiving! Awesome idea. I love the cute faces and feathers. This sounds like my kind of thanksgiving craft! Although you had me at hersheys kisses haha – I might eat them all before I make them turkeys! So sorry to hear about your Mom. Those first holidays are always hard. These are a really cute idea for Thanksgiving! I hope all goes well! How can these not be super fun! I think it’s a nice surprise for your guests on Thanksgiving. I’ve been missing my parents a whole lot especially during the Holidays, so it’s nice to do little things like this that will help the family enjoy the occasion more. 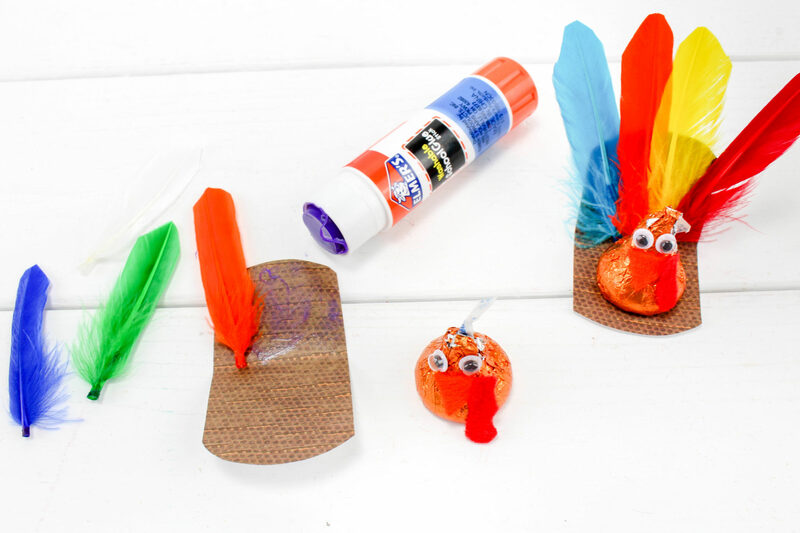 These are probably the cutest Thanksgiving crafts I have ever seen! I cannot wait to show these to my daughter! These are perfect to set at each persons place at the table. My kids and neice and nephew would love them. What a clever Thanksgiving treat turkeys idea. I would have never thought to make these up. They look pretty cool too! These turned out so cute. What a fun craft idea and treat for the Thanksgiving holiday. How cute are those!? They’ll be great to make for a class party with my kids’ classes. 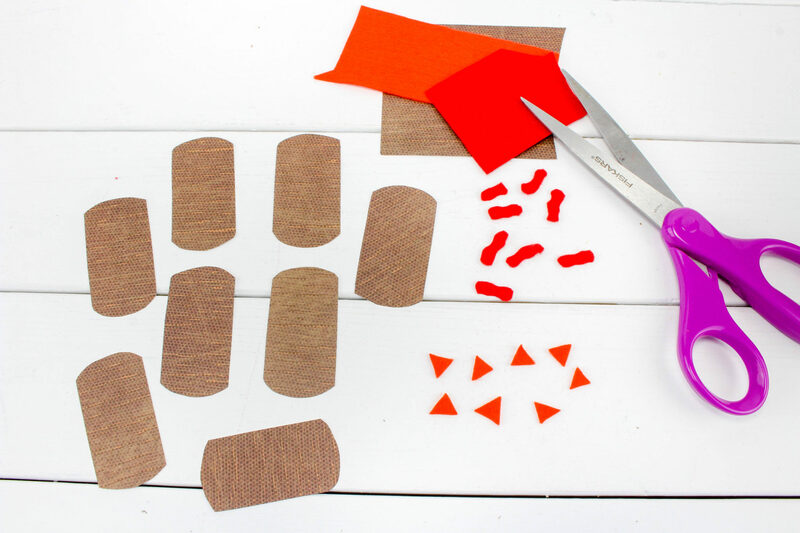 What a fun craft to do with the kids! I cannot believe Thanksgiving is already here! This is such a lovely idea to make things more fun on Thanksgiving. I think it’s really creative and the turkeys are just so cute! So sorry for the loss of your mom. This will be a cute craft to distract your family. Hope you have a wonderful holiday! These are absolutely adorable! My kids are going to love making these during fall break! My kids are going to gobble up these little turkeys! So darling! We like fun crafts to complete on Thanksgiving day while all the food cooks. What a cute little Thanksgiving craft!! I would love to do this with my nieces and nephews!! These little turkeys are so cute!! What a good idea and I feel like older kids could do this craft too! This is a great idea and so cute! I would love to try this for Thanksgiving! Thanks for giving us Thanksgiving ideas early! I never thought to use hershey kisses in this manner this is creative. These look super cute! I bet our kids would love to make these for Thanksgiving! How adorable and perfect for kids. Just the perfect tiny bite of chocolate on thanksgiving! Aw I love how colourful your turkey kisses are! What a great way to inject colour into thanksgiving and a lot of fun as well! I love this craft! These would be adorable on top of the plate for a Thanksgiving feast! These are such cute favors too. You are always so creative with all of these treats! That is one treat I haven’t seen, very unique! Omggggggoodness is there anything cuter than a little candy turkey? I would have never thought to use Kisses to make them, but they are the perfect shape and come wrapped in some great fall colors. Brilliant! 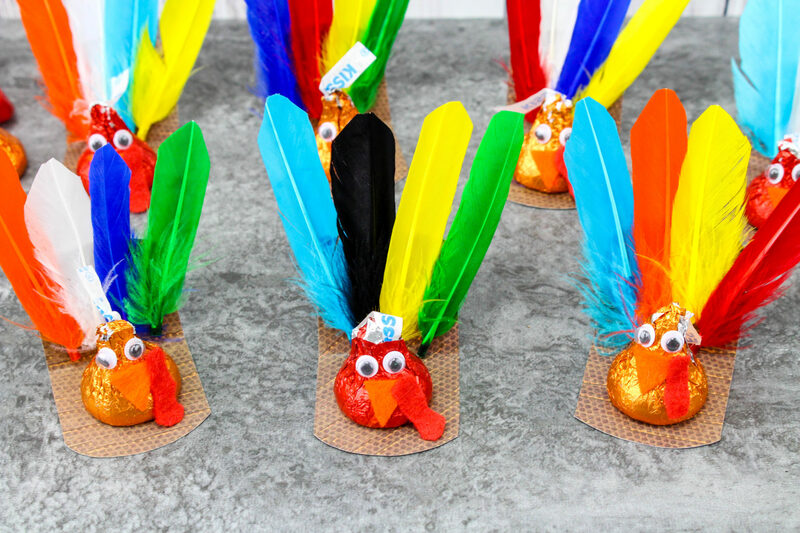 Those chocolate kiss turkeys look absolutely adorable, what a creative idea! I’m sure kids would love this and they could get to play with the feathers afterward. 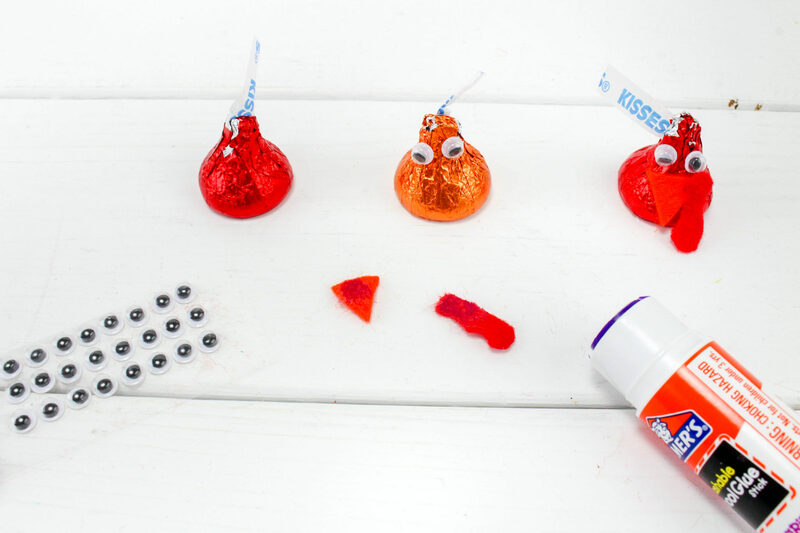 What a great way to use a Hershey’s Kiss! My kids are always wanting to “make” something crafty for our guests, thanks for the suggestion. These are just adorable! They’d be great as a place setting for the kids table at Thanksgiving. Such a cute idea and perfect crafts for the kids. I would love to try these with my two boys. 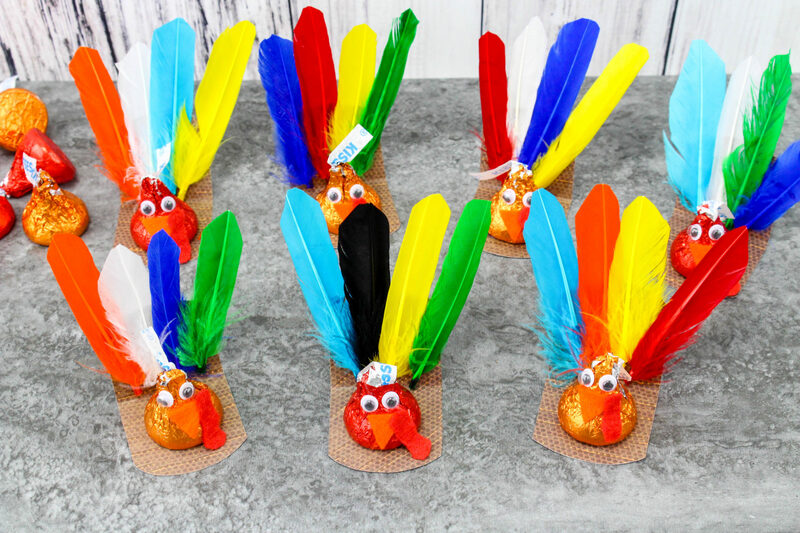 The Chocolate Kiss Turkeys look so colourful and cute. I am sure they will brighten up Halloween. Very cute and creative! My kids would have a blast making these and then eating them of course!! Love how cute they are! This is such an adorable idea! My kids will absolutely love making these for Turkey Day!! This is also going to be the first Thanksgiving without my mom. We lost her 3 months ago and decided it would be too hard to celebrate at home so we are going to my sister’s house. It will also be the first year where we do all the cooking instead of just the helping since my mom kind of liked to do it all herself. I really love these little turkey kisses. I have gotten into the habit of bringing crafts for my nieces and nephews to do on Thanksgiving so this is perfect. These are the cutest! My daughters would have so much fun with this holiday craft. I love this as a treat to leave on dinner plates at Thanksgiving! How cute. These are great for the kids. Both the process of making them, and eating them. 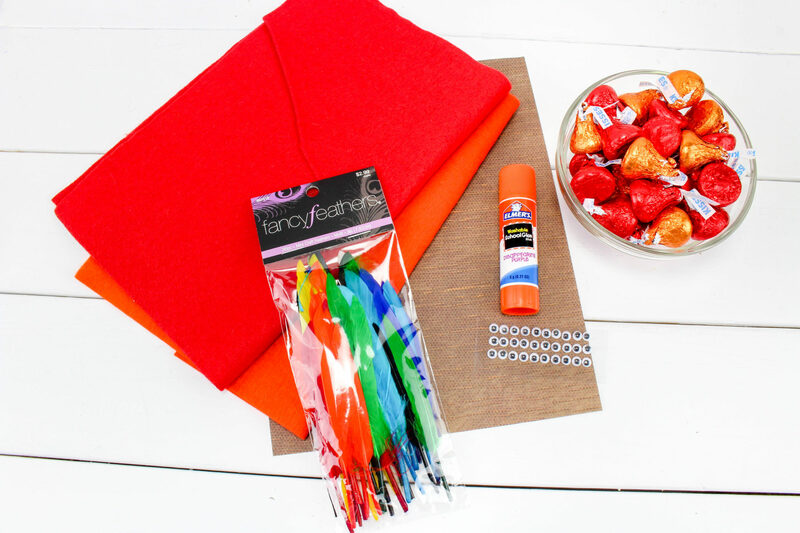 Homemade Jack O’Lantern Crayons #StreamTeam 10 Best Slime Recipes to Make Today!